I pride myself on being a planner. I like to be organized and always would like to know where I am headed so I can best prepare but that's not to say I don't have a spontaneous bone in my body. Which brings me to the day where I decided to travel to New York City. Yep, just a typical Wednesday where I was reminded of the Independent Fashion Bloggers conference occurring the next weekend, so like anyone else I was curious and was pleasantly surprised at the ticket prices. So that was it. I was on my way to New York City. Gala Darling of GalaDarling.com spoke about how the city of New York City has changed her life and blog forever. One of my favorite quotes from her was "I believe in making money from art. Blogging is an art." She was so well spoken and very engaging plus how adorable. I am a sucker for a British accent and a fur skirt so Susie from Style Bubble had me from hello. 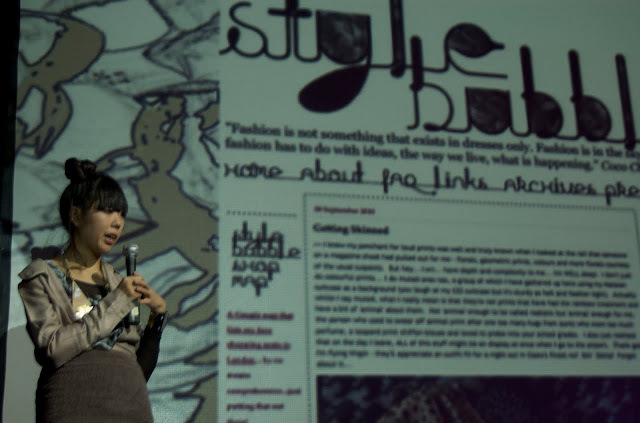 She shared her story of how she has made her way from working in Editorial to giving up a steady job to follow her love of fashion blogging whcih has now lead to styling The Ting Tings. I still can't stop thinking about Susie's jewelry, I want! 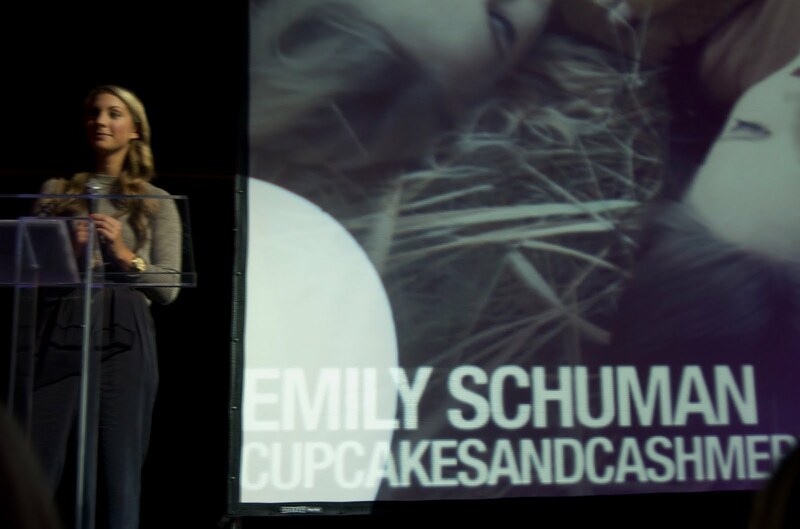 The last part of the conference focused on creating great content and who else is better to speak on the subject but Emily Schuman from Cupcakes and Cashmere. I have been an admirning fan of Emily's long past my own blogging days and was in awe by the words she spoke. 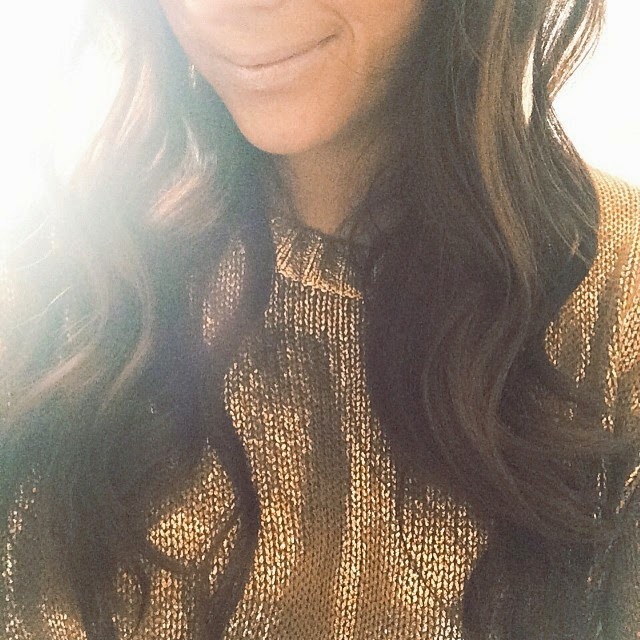 Her well written speech with accompanying photos depicted her blog to perfection. She stressed that is important that with compelling content, intriguing pictures and clean layout you can be a successful blogger. Now if you can only imagine the outfits in a room full of fashion bloggers it was sometimes hard to concentrate on the speakers. 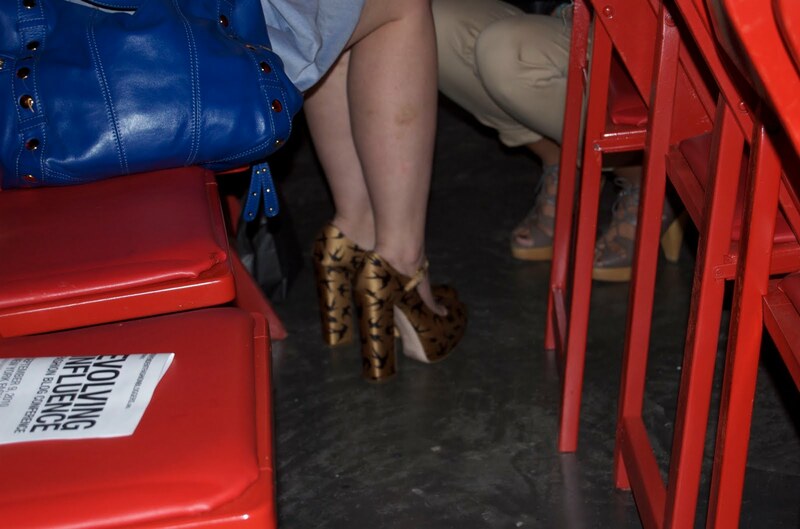 I spied these Miu Miu shoes on one attendee and the feather clutch from an adorable blogger Teryn Frances from Toronto. 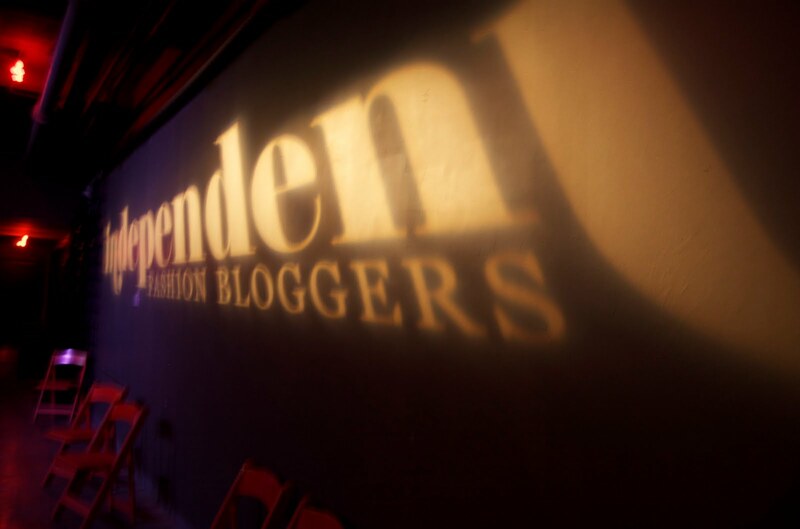 Independent Fashion Blogger conference was an amazing event I wish I could spill every detail about. You'll just have to wait for the next to really see what it is all about! For more pictures from the event check out the Just B facebook page. This event looked (and sounded!) absolutely amazing - I hope I can make it to next year's event!